Orange County Register Aug. 19, 2014 Updated: 10:08 p.m. 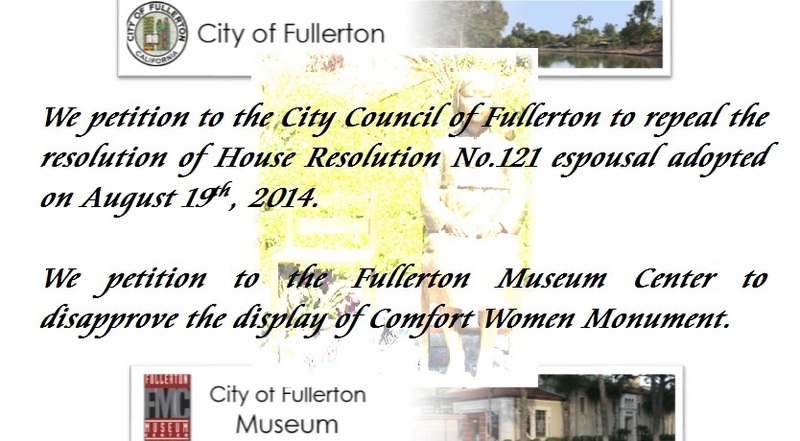 I have sadly known that the council of Fullerton approved the support HR 121 and the support of the Fullerton Museum Center Association displaying the monument honoring Comfort Women, voted August 19, 2014. The Issue on the Comfort Women has been controversial at the international level between Japan and Korea or China for a long time. This means you should listen to the each party concerned before taking sides with any party. Here are several key points that you should know other than the views of Korean side on the Issue. It would be very grateful if you read the following materials and disapprove the display. Interrogated by US Army in Burma in 1944, 20 Korean comfort women prisoners replied that they were very well paid and had free time to enjoy. They said Japanese soldiers were less emotional than American soldiers due to kind treat of US Army and they were afraid of Chinese troops. Those are summary of key descriptions of the US Army Official Report in 1944. It depicts comfort women as nothing more than prostitutes (legal at that time). So the comfort women were not slaves but commercially engaged women. On the other hand, some soi-disant former Korean comfort women make allegations that they were abducted, forced into prostitution and abused by the Japanese Army. Support organizations have tried to spread in the world that the Japanese Army abducted 200 hundreds young women and forced into sexual servitude. But neither physical evidence nor witness has been found. 2. Successive Japanese Prime Ministers have expressed sense of remorse for the comfort women and acknowledged the moral responsibility on the base of current value of human rights and the humanity. Japan made reparation for them. The joint research between Japan and South Korea for almost one year published the result in 1992 that no evidence proving the abduction by the Army was found. And no objective evidence of abduction has ever been found till now in both Korea and Japan. Nevertheless the Japanese prime ministers have successively expressed the sense of remorse on the base of current value of human rights and the humanity, respecting at maximum the human rights of women. Furthermore, the Asian Women’s Fund created in 1995 offered reparations to former comfort women together with letters of consolidation and apology. But the main support organization in Korea put pressure on former comfort women not to receive the reparation despite their willingness. Criticism against the support organization was made inside South Korea, suspecting that the purpose of the organization is not to resolve the issue but rather to preserve the issue which can be used for anti-Japan propaganda or discounting Japan. It is this organization which has mainly spread Anti-Japan propaganda using former comfort women. 3. House of Representatives Resolution No. 121 in 2007 was adopted in abnormal circumstances. Only ten representatives of four hundred thirty five members were present at the adoption. Furthermore the way of voting was voice vote. About 97 % of Representatives who were absent did not show their judgments on the Resolution for any reason. It’s quite doubtful and inadmissible that such a few attendants represent the whole US nation on the very disputable international issue. 4. Japanese Imperial Army took measures to prevent human traffics on the recruitment of comfort women. Japan was a member state of the 1921 Convention (The Convention for suppressing the human traffics in 1921). Unfortunately there were human traffics between parents and brokers on the recruitment of comfort women due to poverty and to Korean historical custom. Korean police under the Japanese rule exercised more strict control over abduction, forcible prostitution and human traffics ever than before. So did the Japanese Imperial Army. The document that the Army tried to stop brokers from engaging in unlawful acts during their recruiting campaigns of comfort women has been found. 5. US Army demanded Japanese government the system of comfort women during their occupation of Japan after WW2. South-Korean government created licensed prostitution system for US Army during and after the Korean War. Neither USA nor Korea has right to blame Japan for having violated women’s human rights at the wartime. 6. Japan has been a peace-loving state for a long time and has respected women’s human rights. Among the letters to their countries written by Catholic missionaries who have come to Japan since 16th century, there are some mentioning that the status of Japanese women are high. The most important and popular deity among Japanese deities is Amaterasu-omikami. This deity is a goddess of the Sun. According to the Japanese oldest historical document, The Emperor of Japan is her direct descendent. So the status of women in Japan has been high since ancient times and women have been always respected in Japan.